FAI – Those three letters that often accompany an asking price on a French property – what do they stand for, and what do they mean? 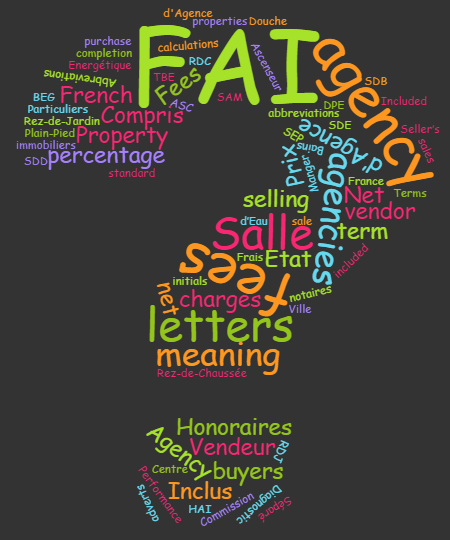 FAI – letters you’ve probably noticed during your internet searches for French properties – but do you know what they mean? They stand for Frais d’Agence Inclus which translates into Agency Fees Included. This means that the price you see is final, and no commission fees will be added, other than the standard notaires’ fees once your purchase has gone through. Whereas in England the asking price is agreed upon and the agency simply deducts its percentage on completion of a sale, in France, the system is a little different. The vendor decides on the amount they’d like to realise and the agency then adds their commission onto that amount. That’s where those three letters – FAI – come in. It also explains why you might see the same property selling at different prices, because if the vendor is marketing their property with several different immobiliers, the commissions might vary. It’s now widely accepted that agency fees will have been included in the stated asking price, which explains why the letters aren’t always used. Nevertheless, it might be worth checking with the agency to be on the safe side if you don’t see the letters. Another term some agencies use is Honoraires d’Agence, meaning that you might find the letters HAI, standing for Honoraires d’Agence Inclus, after the asking price instead. Less commonly you could find the letters CC, meaning either Charges Compris or Commission Compris, both of which mean that the price includes charges or commission. In the past some buyers have been caught out by disreputable agencies quoting the net asking price on websites and property portals to attract more customers – this practise is now illegal. Some agencies might, however, quote the ‘Prix Net Vendeur’ (Seller’s net price) but then show their rate of fees next to it; others might only state the percentage of their fees and leave you to do the calculations. Private sales are known as Particuliers, and of course are not subject to any agency commission. The term to look out for there is Prix Net Vendeur.